Fear of the dentist and dental work is common among both children and adults. This fear causes many patients to avoid the dentist and only go in once they start experiencing physical pain. Unfortunately, by this point, more invasive procedures are often the necessary course of action. And while it’s understandable that going to the dentist may not be your favorite activity, avoiding it is the last thing you want to do. Dental work is often uncomfortable, there is no getting around that fact. Sitting back with your mouth open wide and the dentist poking around with tools and mirrors is far from a holiday. Combine that with the sound of the drill and the underlying knowledge that something in your mouth isn’t right, and you are undoubtedly left with nerves, stress, and even fear. Dentists understand this, and even though you may be scared, it’s essential to remember that dentistry is meant to fix your dental issues so you don’t have further problems down the line. Unfortunately, avoiding the dentist only makes things worse by causing you to postpone the treatments you need. Once you start putting off your check-ups, you run the risk of needing more invasive procedures. While dental work can be simple, with relatively little discomfort early on, it will only worsen the longer it’s put off. While there is no way to make the physical process of dental work fun, there are ways to ease your fears. One of the most difficult parts of dental work is that you are aware of what is happening. You can see everything and you can hear everything. For most people, this causes unneeded stress. Instead of putting yourself through this, and instead of using it as an excuse to avoid the dentist, consider combining your dental work with sedation. Sedation provides additional comfort and safety by easing your anxiety. There are several levels of sedation available to make you physically comfortable and to ease your mind. While some patients find that light sedation, such as the kind provided by inhaled or oral sedation, is enough, others may find that general anesthesia, where you are entirely asleep, is best. No matter what stage of sedation you would prefer, it’s important that you find what you need to make you feel comfortable. There is no reason that you should fear the dentist. After all, they are there to help you, and if combining sedation with your dental visit is what is necessary, then allow sedation to ease your fears. For more information about the types of sedation that Dr. Sands offers, contact his office by calling 310.273.0111 to set up a consultation. This entry was posted on Wednesday, October 31st, 2018 at 3:09 pm	and is filed under Sedation Dentistry. You can follow any responses to this entry through the RSS 2.0 feed. Both comments and pings are currently closed. Dr. Sands offers sedation dentistry for patients who may be anxious or fearful when visiting the dentist. Sedation dentistry is also an option for those who may have a sensitive gag reflex, a special needs child, or no time for multiple visits to the dentist for more extensive procedures. Sedation allows you to be either completely relaxed or asleep during treatment so that none of these things are a concern. During your initial consultation for a dental procedure, Dr. Sands will help determine if sedation dentistry is right for you. Various options for either light sedation or complete sedation are available to keep you comfortable during your treatment. Dr. Sands will ensure your needs are safely and efficiently met and that all your questions are answered before your procedure. Sedation keeps patients comfortable and relaxed during their procedure with the help of various medications. You can choose to be either completely asleep or awake, yet relaxed, during treatment. Oral or intravenous medications, or nitrous oxide (laughing gas), will keep you relaxed, yet responsive, during treatment. If you need deeper sedation, general anesthesia will put you to sleep completely so that you have no recollection of the procedure. Light sedation is administered with a pill that will help you relax. Laughing gas has the same effect and is inhaled through a breathing mask. If deeper sedation or general anesthesia is desired, medication is administered through an IV under the supervision of an anesthesiologist. With all sedation methods, local anesthesia is applied to numb the area. How can I prepare for sedation? You should arrange to have someone drive you to and from your appointment and spend two to four hours with you after your procedure to help you with anything you may need until the effects of the anesthesia wear off. This entry was posted on Monday, March 12th, 2018 at 1:43 pm	and is filed under Sedation Dentistry. You can follow any responses to this entry through the RSS 2.0 feed. Both comments and pings are currently closed. For some people, the thought of going to the dentist sends their heart racing and their hands trembling with anxiety. Some are so anxious about dental procedures that they completely avoid the dentist at all costs. Dr. Kevin Sands is a highly skilled and experienced cosmetic dentist, and he does everything within his power to make every patient as comfortable as possible. Nonetheless, for those who become overly anxious about the thought of going to the dentist, sedation dentistry allows patients to take care of their teeth with a stress-free experience. Sedation dentistry helps patients to be fully relaxed throughout dental procedures so that visits to the dentist are worry-free and pain-free. Medications including nitrous oxide, ketamine, Halcion, propofol, and midazolam help to calm, relax, or put you to sleep. The medication that is right for you will be determined based on your level of anxiety. Patients can receive inhaled sedation by breathing normally, oral sedation by swallowing a pill, IV sedation through a vein, or inhaled or IV sedation so that they are completely unconscious during the procedure. Sedation dentistry facilitates a painless and carefree dental visit so that patients are more comfortable with the procedure. The benefits of sedation dentistry are a huge blessing for patients who have always felt anxious about going to the dentist or who have developed anxiety because of previous dental pain, dental issues, or a bad experience with a former dentist. 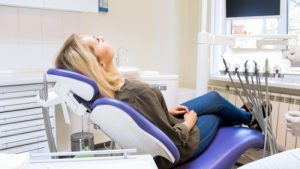 Dental anxiety can be strong and may make it difficult for patients to want to visit the dentist, but with sedation dentistry, patients can feel more relaxed or even sleep through the entire experience. Avoiding the dentist because of anxiety can lead to dental issues such as gum disease, cavities, and infections. Without regular dental visits, these problems continue unchecked until more costly, painful, and difficult procedures are needed to correct them. Due to sedation dentistry, anxious and uncomfortable patients can keep their teeth healthy with stress-free dental visits. To have a worry-free and stress-free dental experience, schedule your dental appointment with Beverly Hills cosmetic dentist Dr. Kevin Sands. Call our office at (310) 273-0111 or fill out our online contact form to request an appointment today. This entry was posted on Thursday, December 17th, 2015 at 2:17 pm	and is filed under Sedation Dentistry. You can follow any responses to this entry through the RSS 2.0 feed. Both comments and pings are currently closed. Many people, for one reason or another, are apprehensive about going to the dentist. They may have had a traumatic experience in their past, or they may simply be afraid of needles, drills, or pain. At the hands of a skilled cosmetic dentist like Dr. Sands, patients have nothing to worry about. 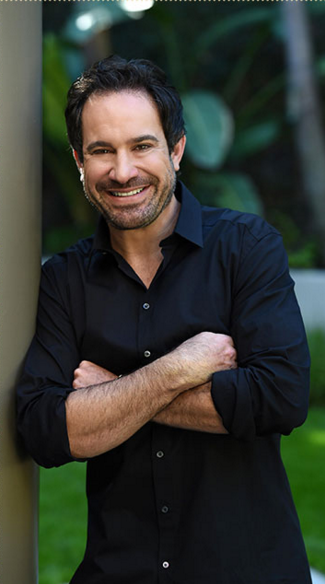 However, since Dr. Sands knows that fear of the dentist is still an issue for many people, he provides sedation dentistry at his Beverly Hills practice. 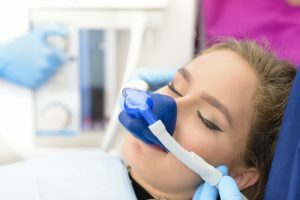 Sedation dentistry, also known as “sleep” dentistry or laughing gas, is the use of nitrous oxide to put patients at ease while they undergo the dental procedures they need or want. It is administered through a demand-valve inhaler that is placed over your nose and mouth, which begins to work just minutes after you inhale. This option is perfect for those who need an extensive amount of work done, as the patient may be able to tolerate a longer procedure while they are asleep. This can also prevent the need for multiple visits to the dental office. Once the valve is removed, the effects of the nitrous oxide will immediately begin to wear off. Many patients are happy that they can go home after treatment without remembering a single thing about the procedure. The same effects can be achieved with oral sedation and intravenous (IV) sedation. Dr. Sands can help you choose the option that will best meet your needs before your procedure takes place. As a celebrity cosmetic dentist, Dr. Sands offers many other accommodations at his practice that relax and pamper his valued patients. 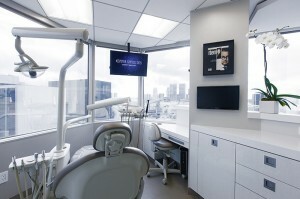 His office is equipped with flat screen TVs and DVDs for your enjoyment, as well as the latest, most advanced technology to shorten the time you spend in the dreaded dentist’s chair. 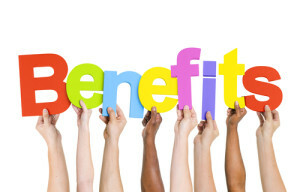 It is a primary goal at our practice to ensure our patients are comfortable, pain free, and stress free at every visit. If you are interested in cosmetic dental procedures or have questions about sedation dentistry, please schedule an appointment with Dr. Kevin B. Sands by calling (310) 273-0111. For your convenience, you may also fill out our online contact form. This entry was posted on Tuesday, April 15th, 2014 at 4:55 pm	and is filed under Sedation Dentistry. You can follow any responses to this entry through the RSS 2.0 feed. Both comments and pings are currently closed.